The first certainly, create your presentation. Or you can open the presentation that you have made. 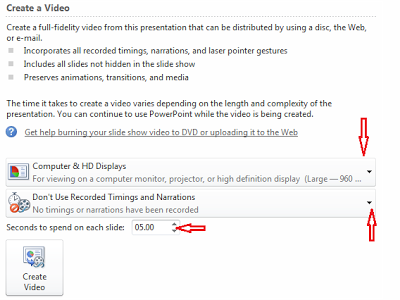 You can record and time narration in a slide show and turn your mouse into a laser pointer. Save the presentation. On the File menu, click Save & Send. 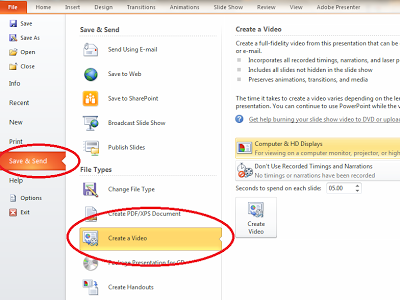 On File Types group, click Create a Video. To create a video with very high quality, yet a large file size, click Computer & HD Displays. To create a video with a moderate file size and medium quality, click Internet & DVD. To create a video with the smallest file size, yet low quality, click Portable Devices. As a suggestion, maybe you don’t know the difference between these options, so you have to test it to see which option meets your needs. If you did not record and time voice narration and laser pointer movements , click Don’t Use Recorded Timings and Narration. The default time spent on each slide is set to 5 seconds. To change that, to the right of Seconds to spend on each slide, click the up arrow to increase, or the down arrow to decrease the seconds. In the File name box, enter a file name for the video, browse for folder that will contain this file, and then click Save. You can track the progress of the video creation by looking at the status bar at the bottom of your screen. The video creation process can take up to several hours depending on the length of the video and the complexity of the presentation. For longer videos, you can set it up so that they create over night. That way, they’ll be ready for you the following morning. To play your newly-created video, go to the designated folder location, and then double-click the file. Good luck, guys.